For an otherwise quiet play, "The Velocity of Autumn" begins loudly, with the sound of a large explosion shooting through a dark theater at Arena Stage. WASHINGTON – For an otherwise quiet play, “The Velocity of Autumn” begins loudly, with the sound of a large explosion shooting through a dark theater. Alexandra, a woman in her late 70s, has holed herself up with a bunch of explosives in her Brooklyn brownstone. When the curtain rises and the stage lights go up, she is sitting in the second-floor living room, asleep in her armchair. Her middle-aged son, Chris, scales a tree to get into the room because the front door is sealed with duct tape and blocked by furniture. When he opens the window and tries to climb through it to talk her out of blowing up the house, Alexandra is startled awake, and 90 minutes of brilliant acting begins. The play at Arena Stage only features those two characters, who are both onstage for the entire performance. It is so silent at times that the audience members seated on the stage level are told when they sit down that they will not be allowed back in if they leave the theater. 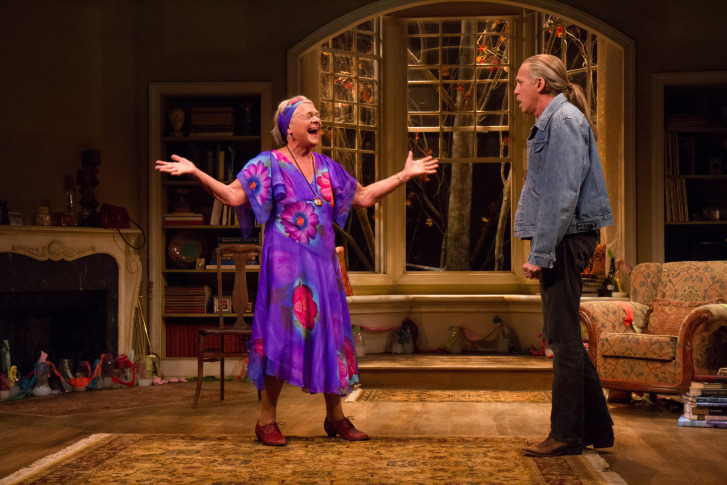 Despite the inherent challenges of a quiet two-person play, both Alexandra (Estelle Parsons) and Chris (Stephen Spinella) come to life in a tangible, personal way onstage. The actors move, speak and interact with each other as though the stage has always been their home. Both of them are clearly comfortable with themselves and with the roles they are portraying, putting everyone at ease during the performance. That relaxed atmosphere made it more forgivable when Parsons admitted at one point that she had forgotten her next line. She cleverly worked it into the play, saying it aloud while staying in character. The audience simply laughed it off, casual and friendly, until Parsons remembered what to say a few moments later. It was a flawless mistake. Moving monologues from both characters at different moments in the play pull the audience from one side to the other, to sympathize with Chris, then Alexandra, then Chris again. In the quiet theater, each point of view seemed right. It was both rational and wrong for Alexandra to want to blow herself up and end the tragedy that old age has wrought. The play’s brutally honest portrayal of old age allows you to see your mother, your friends’ mothers, and even a bit of your own fear in Alexandra. She is an old woman who just wants to be herself again, with control over her own life. And if she can’t control that, if she can no longer paint or walk through museums or do the things she loves, then she wants to at least control her own death. The Velocity of Autumn is at Arena Stage through Oct. 20. For more information on tickets and times, visit the website.